Devoid of excessive shelves and drawers, this ultra-modern desk from HomCom is the perfect addition to the work focused office. The L-shape gives you maximum desktop space while still fitting into almost any size office. The desktop is made out of smoked glass, keeping it lightweight but still looking good. The frame is made out of steel making it strong, stable, and ready for long days and nights. To maximize available space there is a built in keyboard tray and space for your CPU. The sleek look and high-function design make this desk the perfect addition to any home office, dorm room, or boot strapped start-up. 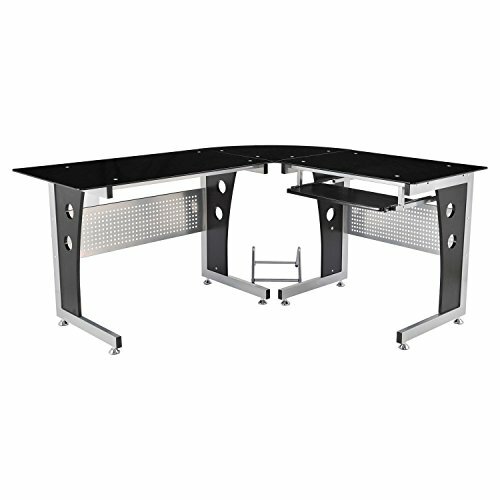 Make your work area the ultimate place for effeciency with this HomCom computer desk. - Keyboard tray: 23.6" x11.8"
L-SHAPED CORNER DESIGN: The space-saving, wrap-around style offers plenty of surface space for home, office, work-related, or gaming activities. STURDY AND DURABLE CONSTRUCTION: It's built stable, with a powder-coated steel frame and long-lasting MDF material in a black wood finish with a dark glass desktop. PORTABLE COMPUTER TOWER CART: This workstation includes a detached computer tower cart on smooth-rolling wheels making it a convenient way to store and transport your CPU tower. MODERN DESIGN: It features a contemporary design which fits in well with any indoor home or office décor.